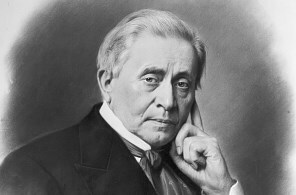 As the first Secretary of the Smithsonian, Joseph Henry, a scientist known for his discoveries in the field of electromagnetism, organized the Smithsonian’s first scientific research projects. Henry spurred the development of many branches of science in the nation by enlisting the government’s support of research. Under Henry, the Smithsonian became the leading supporter of anthropological research in the United States. Baird, a naturalist and avid collector, presided over the Smithsonian during the years of exploration in the West. The territorial surveys and expeditions of the time resulted in outstanding natural history collections for the Smithsonian. Baird also developed an international publications exchange, and he helped establish the U.S. Fish Commission. Baird’s own collections of specimens were donated to the Smithsonian and formed the nucleus of what was later to be the National Museum of Natural History collections. Langley was best known for his studies in aerodynamics and astronomy. As Secretary, he established the Smithsonian Astrophysical Observatory. His interest in the preservation of near-extinct animals, such as the American bison, led to the beginnings of the Smithsonian’s National Zoological Park. Walcott was a geologist who had extensive influence in the development of forestry services in this country. At the Smithsonian, he presided over the opening of the Smithsonian’s National Museum of Natural History (1911) and the Freer Gallery of Art (1923). During his tenure, the National Collection of Fine Arts (now the Smithsonian American Art Museum) became a separate museum at the Smithsonian. Abbot was known for his solar research and for his theory that the world’s weather is correlated with cyclical variations in the sun’s energy output. One of the early believers in solar energy, he established the Smithsonian’s Radiation Biology Laboratory to study the effects of sunlight on living organisms. Abbot was one of the first people to have a moon crater named for him, and he was present when the Apollo 11 astronauts brought the first moon rocks to the Smithsonian. He died in 1974, at the age of 101. Wetmore was an ornithologist who served as head of the Smithsonian’s National Zoo and as Assistant Secretary before becoming Secretary. During his career at the Smithsonian, Wetmore oversaw the growth of the collections (from about 10 million to more than 18 million specimens), the opening of the National Air Museum (then located in the Arts and Industries Building and now the Smithsonian’s National Air and Space Museum) and the Canal Zone Biological Area (now the Smithsonian Tropical Research Institute) in Panama. Carmichael, a distinguished scientist and professor, was responsible for saving the Patent Office Building that now houses two Smithsonian museums (the National Portrait Gallery and the Smithsonian American Art Museum). He planned the National Museum of History and Technology (now the Smithsonian’s National Museum of American History), which opened in 1964. The expansion of the east wing of the Natural History museum was completed during his tenure. By the time Carmichael left office, more than 10 million visitors were coming to the Smithsonian museums every year. It was Ripley’s vision of museums as places of education and fun that led to a blossoming of special exhibitions and live events, such as the annual Smithsonian Folklife Festival. During his tenure, the Smithsonian expanded dramatically, adding eight new museums, including the Cooper Hewitt museum in New York City. In addition, the Museum Support Center in Suitland, Maryland, a storage and conservation facility, opened during his tenure. The Museum of African Art on Capitol Hill in Washington became part of the Smithsonian and is now the National Museum of African Art. Ripley developed the concept for the underground museum complex that houses the National Museum of African Art, the Arthur M. Sackler Gallery and an exhibit and classroom area that later was named the S. Dillon Ripley Center. Adams, an anthropologist known for his extensive research into ancient civilization, began his term as Secretary Sept. 17, 1984. As Secretary, he placed great emphasis on broader representation and involvement of many diverse cultural and ethnic communities in the Smithsonian and its programs. Adams placed a high priority on Native American concerns involving museum collections of Native American artifacts and human remains. He focused on cultural and biological diversity, enhancing research at the Institution, improving the quality of the Institution’s exhibitions and activities and expanding the Smithsonian’s educational programs. I. Michael Heyman, a law professor and former chancellor of the University of California at Berkeley (1980-1990), had served as counselor to the Secretary of the Interior before becoming the 10th Secretary of the Smithsonian. During his tenure, Heyman began an ambitious program of reaching out to Americans who cannot visit Washington, extending the reach of the Smithsonian beyond the beltway. His initiatives included a first-ever traveling exhibit of treasures for the Smithsonian’s 150th anniversary in 1996, a Smithsonian Institution site on the World Wide Web and a new affiliations program for museums around the country. Ground was broken for the National Museum of the American Indian on the Mall, major renovations of several Smithsonian museums were set in motion and research facilities were expanded. Philanthropic giving under Heyman rose from $52 million in fiscal year 1995 to $146 million in fiscal year 1999 and included a $60 million contribution for the National Air and Space Museum’s Steven F. Udvar-Hazy Center. Heyman modernized and expanded the Smithsonian’s revenue-producing activities by establishing Smithsonian Business Ventures (now Smithsonian Enterprises). Lawrence M. Small was installed as the 11th Secretary of the Smithsonian in January 2000. Before coming to the Smithsonian, Small had been the president and chief operating officer of Fannie Mae, the housing finance company, since 1991. Under Small’s leadership, the Smithsonian opened the Steven F. Udvar-Hazy Center, the companion facility of the National Air and Space Museum on the National Mall, in December 2003. In September 2004, the Smithsonian opened its new National Museum of the American Indian on the National Mall, the only museum dedicated exclusively to Native cultures. Congress established the National Museum of African American History and Culture as the Smithsonian’s 19th museum in 2003. During his tenure, Small also committed to renovating and modernizing the Smithsonian’s aging buildings. The massive renovation of the Patent Office Building, the Smithsonian’s oldest building, culminated in July 2006 with the establishment and grand opening of the Donald W. Reynolds Center for American Art and Portraiture, which houses the National Portrait Gallery and Smithsonian American Art Museum. Cristián Samper, a biologist and international authority on environmental policy, was appointed Acting Secretary of the Smithsonian March 26, 2007. Samper guided the Institution during a year of transition, working with the Board of Regents on comprehensive governance review and reform, as well as improved internal communications. Samper worked with Congress to increase federal funding for facilities while emphasizing the importance of investing in the programs at the core of the Smithsonian’s mission—research and training, collections, exhibitions and digital outreach. Samper restructured and refocused Smithsonian Enterprises (formerly Smithsonian Business Ventures) and oversaw the infusion of new leadership, hiring museum directors for the National Museum of the American Indian and the National Portrait Gallery. Before he was named Acting Secretary, Samper served as director of the Smithsonian’s National Museum of Natural History, since 2003. He resumed his role as director of the museum after serving as the Acting Secretary for more than a year. Wayne Clough was elected the 12th Secretary of the Smithsonian and officially assumed the office July 1, 2008. Clough immediately began establishing a strategic plan with four main themes that would guide the Smithsonian’s work in the coming years. He put a new emphasis on education and digital technology, envisioning the Smithsonian as a national forum for informal education. He worked to make the Smithsonian a relevant part of people’s lives through innovative educational outreach programs, support and promotion of hundreds of global scientific research projects and collaboration with universities and cultural organizations on everything from saving endangered species to preserving artwork destroyed in a natural disaster. He oversaw several major openings at the Smithsonian, including the David H. Koch Hall of Human Origins and the Sant Ocean Hall at the National Museum of Natural History. Construction of the National Museum of African American History and Culture began in 2012, and it opened in September 2016. Before his appointment to the Smithsonian, Clough served as president of the Georgia Institute of Technology for 14 years. Albert Horvath was appointed Acting Secretary of the Smithsonian Jan. 1, 2015. Before he was named Acting Secretary, Horvath was the Under Secretary for Finance and Administration and CFO of the Smithsonian, where he oversaw many Smithsonian offices with more than 2,200 employees, including facilities and maintenance, human resources, security and financial operations. He resumed this position after serving as Acting Secretary. Horvath joined the Smithsonian in 2011. Dr. David J. Skorton is the 13th Secretary of the Smithsonian and the first medical doctor to hold the position of Secretary. Under Skorton’s leadership, the Smithsonian developed a bold strategic plan that focused on a more unified Institution that engages the public on critical issues of the day. He announced that, for the first time, the Smithsonian would open a gallery in another country—the Smithsonian gallery in the Victoria & Albert East in London and, closer to home, opened the National Museum of African American History and Culture opened in 2016. In 2018, Skorton guided the conclusion of the Smithsonian’s most successful fundraising campaign ever, totaling $1.8 billion. Skorton previously served as president of Cornell University from July 2006. Educated as a cardiologist, his research focus was congenital heart disease and cardiac imaging and image processing. An ardent and nationally recognized supporter of the arts and humanities, Skorton has made the advancement of the arts a priority at the Smithsonian.